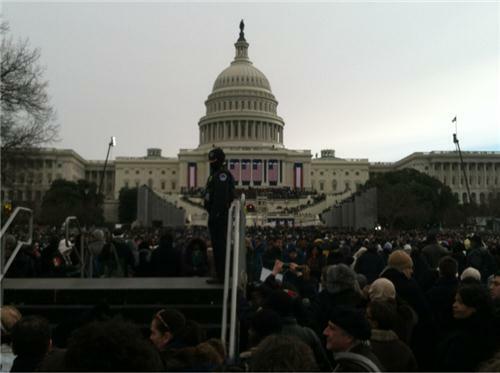 Get the latest updates on Obama's second inauguration. Members of Congress are taking advantage of their perch and snapping photos of the Mall. Their spouses have also been seated. John Mayer and Katy Perry arrive for the ceremonial swearing-in of President Barack Obama at the U.S. Capitol. 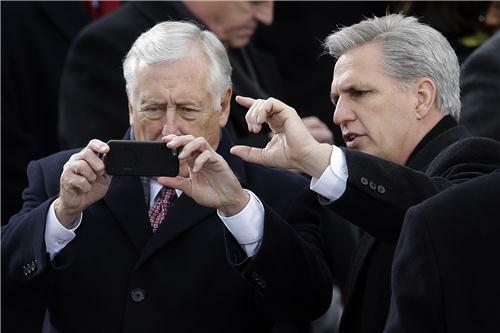 Democratic House Minority Whip Steny Hoyer of Md., left, gets help with his cellphone camera from Republican House Majority Whip Kevin McCarthy of California ahead of the inauguration ceremony. According to a White House pool report, the first lady is sporting a navy Thom Browne dress and coat. "The fabric was developed based on the style of a men's silk tie," the pool report reads. Mrs. Obama tops the coat off with a J. Crew belt and shoes. Her necklace is by Cathy Waterman and her cardigan is by Reed Karkoff. The ensemble will be sent to the National Archives when the day is over. The president's daughters, Malia and Sasha, are dressed in J. Crew and Kate Spade respectively. The appearance of Vice President Joe Biden is greeted with cheers of "Hey Joey!" and "Yeah, big Joe!" President Obama gets applause and cheers. U.S. Capitol Police stand guard at every entrance as many try to hop fences to get a better view. Nasir Osman, 27, thought Obama "said just what he needed to" in his inauguration speech -- particularly on the economy. Osman drove from San Diego to D.C. with his cousin to see the inauguration. Marilyn Porter came from Chicago to see President Obama's first inauguration in 2009, and she was back again Monday. Porter says the second inauguration feels "more meaningful" because of the job Obama has left to do. "It's about getting people together, it's not about politics and money, and it's about getting our representatives on board," Porter said of his second term. 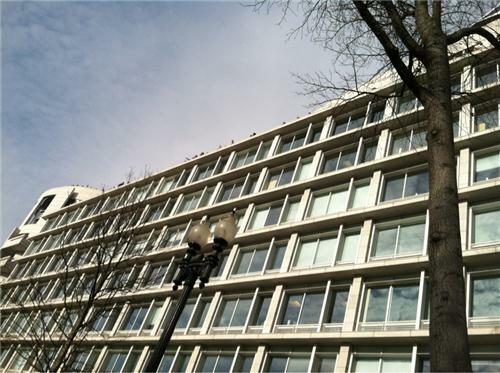 While most inauguration attendees watched the ceremony Monday on a giant JumboTron on the National Mall, others secured a birds-eye view from the top of nearby office buildings. With the day winding down and President Obama heading to the White House, I asked a few people what's next for them. Please check back tomorrow for highlights from the ceremony, the parade route, and the streets of D.C.